Fitting adventure into a busy lifestyle can be difficult- big expeditions and challenges take a lot of time, planning, expense and equipment. However, it is possible to add a slice of adventure into your days, without uprooting your life and breaking the bank. Wilderness Weekends organise adventures which are close to home, cost-effective and easy to fit around a busy lifestyle. They offer a wide range of trips, from mountain adventures, climbing, canoeing and bike treks, to wild swimming, bushcraft and camping. 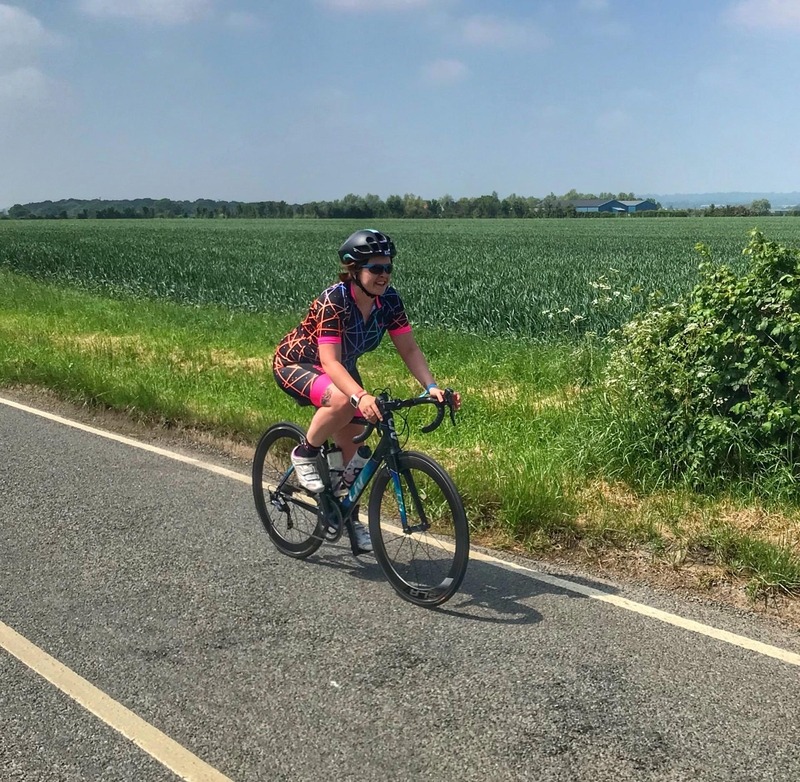 I was invited to join the team on one of their cycle touring breaks in Kent and East Sussex. Combining cycling, camping, yoga and gourmet food- it sounded like the perfect weekend! This was my first experience of cycle treking, so I must admit I wasn’t kitted out with the most appropriate bike and clothing. My aero wheels, carbon frame and lycra shorts are more suited to triathlon than touring. Several sections of the route were off-road, so I struggled on my skinny wheels, but it was a learning experience and next time I’ll be better prepared. Beginning at Wadhurst station, we made our way down to Hastings through the High Weald AONB. We passed through picturesque villages, woodland and green landscape. The roads were undulating with a few big hills, but nothing too challenging. At Hastings, we stopped for fish and chips by the beach, before taking the funicular railway up the steep cliff face. From the country park on the cliff top, we had fantastic views of the seaside town below. Back onto the road and it was a much flatter ride into Rye, where we took a short break to wander around the cobbled lanes (not easy in cleats)! There were a final few miles along the seafront into Camber Sands- our resting place for the evening. Our group was a mixture of abilities but cycle guide Aidan did a great job of making the ride suitable for all levels. I was able to sprint off on some road sections whilst the rest of the group took an off-road path and we met at the junction. I was also impressed at how he navigated the entire route from a paper Ordnance Survey map- no Garmin or Google maps here! After 42 miles and 3000ft of elevation, we were grateful to arrive at Camber Sands Holiday Park. Our tents and bags had been taken ahead to the campsite and set up, so we could simply relax and freshen up for dinner. We ate at delicious meals at the Gallivant opposite the beach. The environmentally sustainable restaurant uses locally sourced produce from including Romney Marsh lamb and Dungeness Cod. Exhausted from the day, I got comfortable in my tent with my sleeping bag and air mattress kindly supplied by Decathlon. It’s the first time I’ve camped without my husband Glen, so again this trip took me outside of my comfort zone in a small way. A yoga class and brunch was the perfect way to ease into our second day of adventure. Maria, founder of Wilderness Weekends lead us through a series of postures under a tipi next to the sea. Again, the class was made suitable for all abilities. Back on the bikes, we headed towards Dungeness. Situated on a headland at the Southernmost point of Kent, Dungeness has a strange otherworldly atmosphere. It’s known as the ‘desert of England’ due to the large, bleak expanse of shingle which is home to rare species of insects, moths, wild bees, spiders and beetles. Ramshackle wooden huts are dotted around the peninsula, many of which are owned by artists, filmmakers and writers. In stark contrast to these homes is the nuclear power station which gives a surreal feel to the landscape. Dungeness really did put the ‘wilderness’ into Wilderness Weekends! After leaving Dungeness, we headed North through villages like Brookland, Appledore and Woodchurch. I recognised some of the areas from the Owler Triathlon last year. This was one of the most enjoyable parts of the trip, as the country lanes were completely flat, quiet and scenic, although windy! I had to ride carefully as my deep rim wheels were very twitchy in the crosswinds. The roads became more urban as we approached Ashford, so we followed cycle paths into the town centre. After covering 37 miles, our cycle tour ended at Ashford International Station where Maria met us with our tents and bags. In a short weekend, I’d explored a new area of the country by bike, enjoyed delicious food and met a group of adventure-loving cyclists. My trip was complimentary, but all opinions are my own. Have you ever been on a cycle touring trip? How do you add adventure into your lifestyle?